As we write this post (10/26/17), the price of Bitcoin is sitting at US $5,506. It is down 8.54% from the high of US $6,020 reached on 10/21/17. Having said that it is still up 3.40% over the 2 weeks from 12/10/17, at which time the price hit a new all time high of US $5,325. What we want you to see is, that, like all investments, Bitcoin carries financial risk. It is important to understand that your funds are at risk, and you should never invest more than you can afford to lose. Having said that, we have invested in Bitcoin, mostly through USI-Tech Bitcoin packages, and will continue to invest in Bitcoin (with amounts we are happy to put at risk). If, like us, you are fairly new to investing in Bitcoin, then getting started can be a daunting task. No matter how you buy your Bitcoin, you will need a trusted wallet to store your Bitcoin. After some web surfing, we decided to create a blockchain wallet. The Blockchain website is well established and has a good reputation. We felt confident trusting them as a wallet provider. One thing we found is that the default security settings are for fairly easy access. If you want extra security (such as mobile phone SMS verification and other additional security), you need to manually activate these features. Once you have set up a Bitcoin wallet, you are ready to receive Bitcoin. It's important to remember that a Bitcoin wallet, it is yours forever. 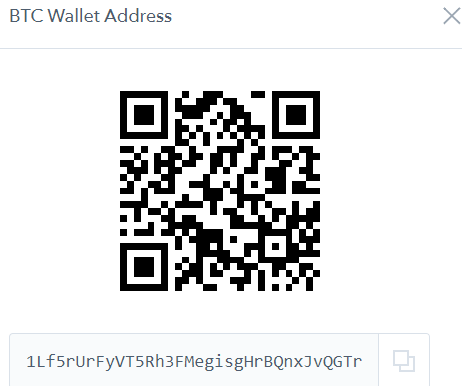 While we are not actively using the above wallet, any funds sent to that QR code or wallet address would still be ours. For this reason it is important to make sure that you keep track of any Bitcoin wallets you set up and make sure you know how to access them. After setting up our wallet, our next challenge was in buying some Bitcoin. For this we managed to buy Bitcoin with a credit card through CEX. CEX is purely an exchange so they do not offer a wallet service. You should set up a wallet before buying Bitcoin, then once the buy has been confirmed, you can transfer your Bitcoin from CEX to your external wallet. CEX, like many other Bitcoin service providers, will only show balances of confirmed transactions. The first time we sent a small amount of Bitcoin to CEX, it took over 6 hours for the Blockchain to confirm the transaction. During this time, the balance in our Blockchain wallet had decreased, but there was no sign of our funds in CEX... this was to say the least a bit stressful. The reason we share this is because it might happen to you, and believe it or not, it's nothing to stress about. The delay in our transaction was partially our fault, for not opting to pay a higher fee for faster transactions. Transaction lags are part of how Bitcoin works. The important thing to remember is that if you have sent the correct amount to the correct wallet, then you have nothing to worry about. The worst thing that can happen is that the transaction is cancelled and your Bitcoin is sent back to your original wallet. If you are looking for a simple one stop shop to buy and hold your Bitcoin, then Bitpanda is for you. Bitpanda automatically sets you up with wallets for Bitcoin and a selection of other cryptocurrencies known as 'alt coins'. Bitpanda also offers 2 factor authentication via sms to a phone. Once again we like this added level of security which prevents hackers accessing our funds. We have tested Bitpanda for both buying (with a credit/debit card) and selling (through Skrill). We can confirm that everything went as expected. One advantage we noticed is that Bitpanda balances updated very quickly and we were able to sell our Bitcoin for Fiat currency extremely fast. Unlike others, Bitpanda didn't make us wait several hours while the blockchain caught up with our transactions. Bitpanda is an excellent option for buying and holding Bitcoin. They make buying and transferring Bitcoin as simple as copying and pasting. Once you know the wallet address and amount of Bitcoin you need to send, all you need to do is fill in the boxes. Bitpanda provides a simple way to buy hold and transact with Bitcoin and other alt coins. Another one stop site we found was Coinbase, who are another company who let you buy and sell Bitcoin with a Credit/Debit card. We discovered that in Australia they do not allow you to sell to a credit/debit card, but you can still buy Bitcoin through them. While the fees on Coinbase are slightly higher than those on Bitpanda, they are currently running a promotion where if a new customer buys US $100 or more worth of Bitcoin, then they will give you an additional US $10 (in Bitcoin) as an opening deposit bonus. It costs you nothing to open and keep the wallet so you could get US $10 just for signing up with Coinbase and making a deposit of $100. Once you have a wallet and a way to buy and sell Bitcoin, then we hope that investing in Bitcoin will be a lot easier. We have only shared our experiences with services we have tried ourselves, we'd love to hear from you in the comments section below.